When a high Buddhist master comes to visit, he is traditionally welcomed by a painting of the 8 Auspicious Tibetan Symbols. 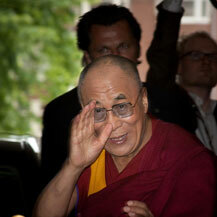 In 2009 His Holiness the Dalai Lama paid a three day visit to Amsterdam, The Netherlands, to offer his teachings and meet with officials. 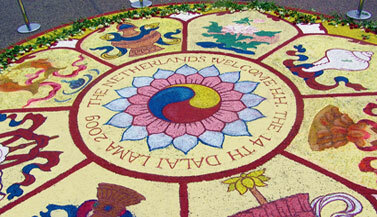 It was a very special event, as it was his first visit to The Netherlands in ten years. 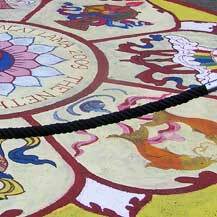 According to the Tibetan Buddhist tradition, a highly respected lama is welcomed to another monastery by Eight Auspicious Tibetan Symbols, that are painted in front of the temple. 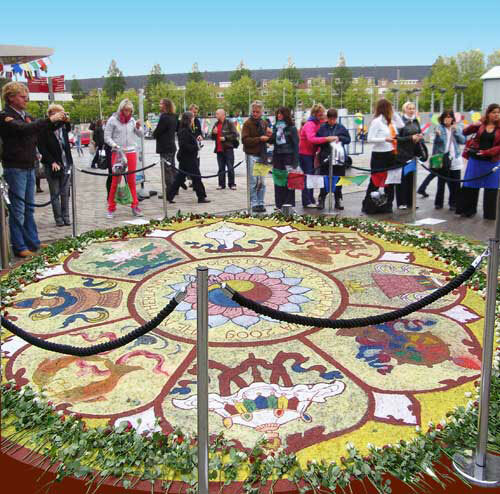 Carmen Mensink was asked to design, paint and coordinate this project & ritual, in front of the entrance of the teaching hall in Amsterdam (the RAI conference hall), where about 18.000 people would attend the lectures and teachings of the Dalai Lama. 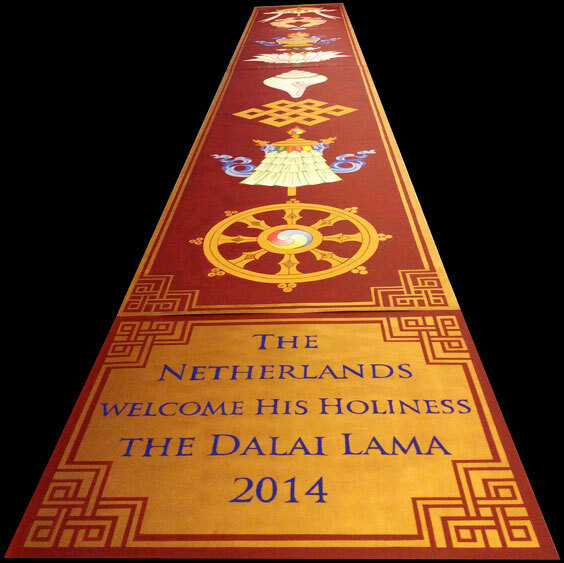 In the months before the Dalai Lama’s visit, Carmen designed the complete artwork, that will be 5 meter wide (16.4 ft). 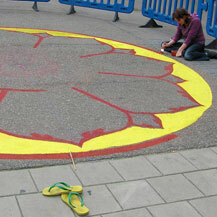 She created a lotus flower shaped diagram with 8 lotus petals, to paint one of the symbols in each petal. 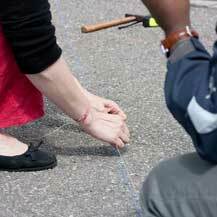 The day before the Dalai Lama’s teachings, Carmen and one of her assistants started early in the morning to draw out the basic lines and circles for the painting. 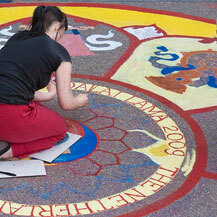 It is all done on the pavement in front of the event hall. 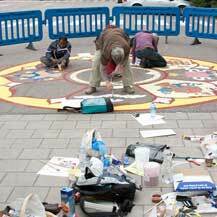 First the outer circle is painted. 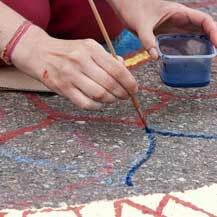 Working from outside to inside is the traditional way of painting thangkas. 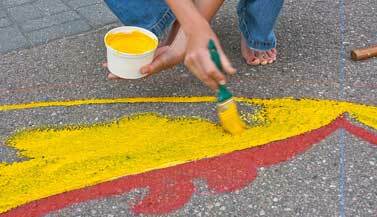 The colors that are used -maroon red and a golden yellow- are commonly used in the tibetan Buddhist tradition. 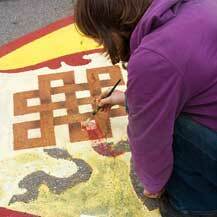 In the morning more assistant arrive to help paint the lucky symbols. 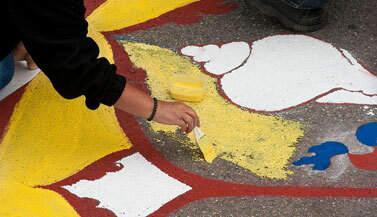 Painting is not that easy as the paved area has quite a rough structure. Carmen chose to create the artwork not with regular paints, but with a mixture of loose pigments and water, with the idea behind it that the painting would eventually be washed away by the rain, symbolizing detachment and the impermanence of all phenomena. 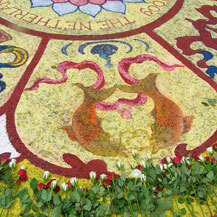 This idea is comparable to a sand mandala; a unique and carefully created ritual artwork made from colored sand that takes many days to accomplish. It is accompanied by prayers and mantras and attracts the energy of the deity (that is connected to the particular mandala). 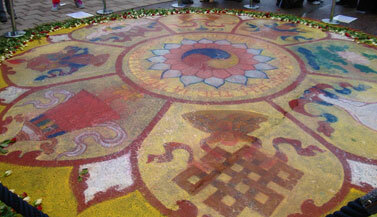 The whole ritual is said to be purifying and healing the environment in which it is made. 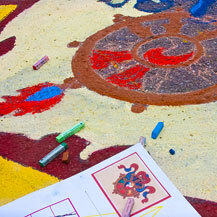 After the sand painting is accomplished it is dismantled by a ritual and all the sand is mixed together again. 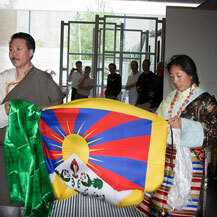 In the meantime, at Amsterdam Schiphol Airport, the Tibetan Community of The Netherlands is waiting to welcome the Dalai Lama in the country. 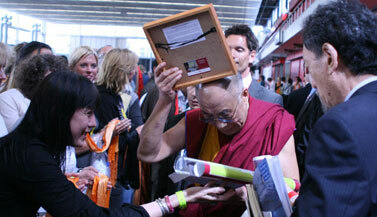 Everybody’s offering katas, the traditional Tibetan blessing scarves. 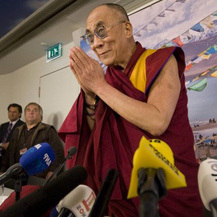 immediately after arrival, the Dalai Lama gives a press conference. The Eternal Knot is beautifully shaded to give it a three-dimensional feel. It takes a very long time to draw and paint each symbol. This is the golden Dharma Wheel. The shape of the painting looks a bit like a Tibetan Mandala. 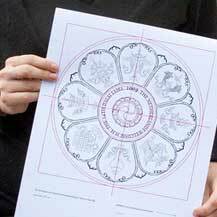 Mandala is a Sanskrit word, and its Tibetan equivalent is dkyil-khor, meaning ‘that which encircles a centre. In addition to the Eternal Knot and the Dharma Wheel, the Pair of Golden Fishes, the Umbrella, the Lotus, the Victory Banner and the Treasure Vase were painted in, as well as the White Conch Shell. Slowly and bit by bit the painting is coming together and everybody works tirelessly till late in the evening, until it was completed. To protect the artwork it was covered with plastic for the night (in Holland it tends to rain a lot!). The next morning at 6.30am, on June 4th, Carmen took it of again and prepared it for the special day, ready for H.H. 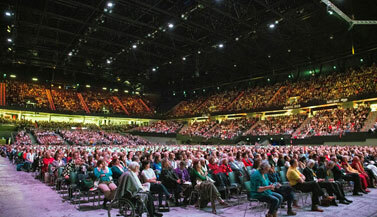 the Dalai Lama to see, as well as the 18.000 people who attended his teachings that day. 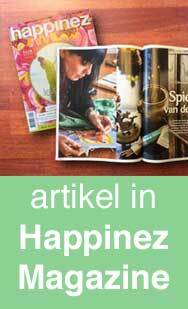 The short video shows part of the teachings H.H. 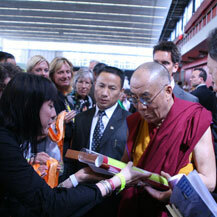 the Dalai Lama gave that day (translated in Dutch by Hans van den Bogaert), in the big hall full of people. Besides the wonderful teachings and the painting, there was more to explore. Inside the event hall Carmen had a booth that day where she sold her thangka paintings, mandala posters and Buddha cards. 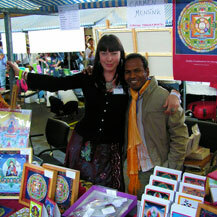 On the right she poses with her friend and thangka painter Sashi Kumar. People from Amnesty International next to her were handing out roses to everyone. 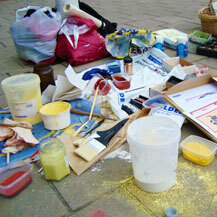 Carmen went outside to check on the painting and the big drops of rain had already slightly affected the artwork. 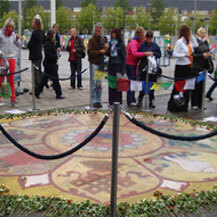 But the most amazing thing was to see how people had spontaneously put their roses around the whole painting! 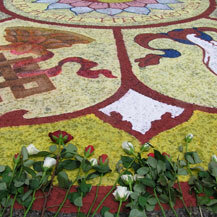 Imagine how a few people started putting their rose down and hundreds of others followed… the symbols painting became a symbol in itself, symbolizing the wonderful day that we all had been part of… so very touching. Just as everything else in our life. 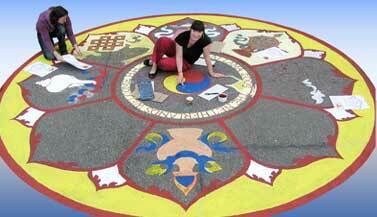 Carmen regularly offers Tibetan Symbols drawing & painting classes – check out the schedule!